This entry was posted in Safety gear & equipment on 2017/09/13 by Susan. 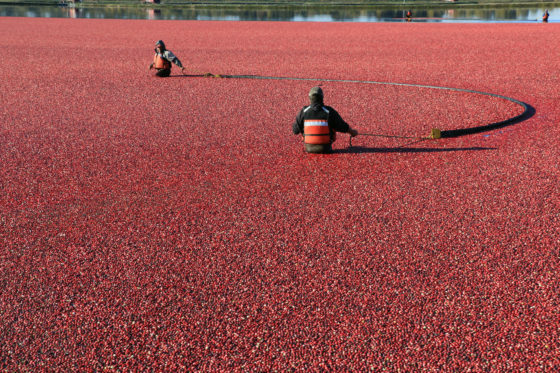 In a cranberry harvest, fields are flooded with water. Lifejackets or personal flotation devices (PFDs) are essential to prevent workers from drowning. A cranberry harvest is unique. The fields are flooded and workers knock the berries off their vines, then skim them from the water’s surface. Wearing a lifejacket or PFD reduces a worker’s risk of drowning in shallow or deep water. Water depth varies in a cranberry field. Safety advisor TJ Garcha of AgSafe (B.C.’s safety association for farm employers and workers) says some parts could be up to 3 feet deep – or even more. When people fall face-down into water, they can drown, even if the water is only a few inches deep, TJ says. This summary of a WorkSafeBC incident investigation, Worker died after being submerged in flooded cranberry field, describes a tragedy that happened in deeper water. While harvesting cranberries in a flooded field, a worker inadvertently walked into a 6-foot-deep ditch. His co-workers rescued him, but he died in hospital. It makes me so sad to think that this could have been prevented with a lifejacket. What’s the difference between a lifejacket and a PFD? Lifejackets are designed to turn unconscious people face up in the water, so they keep breathing. Personal flotation devices (PFDs) are more compact and keep people afloat but cannot turn them face up. A PFD is sufficient if a worker is not alone and another worker can help immediately. Otherwise, a lifejacket is needed. WorkSafeBC says a worker must wear a lifejacket “when he/she is not within eyesight or earshot of another worker who can immediately come to the first worker’s aid in the water” (page 2 of the safety bulletin Flooded cranberry fields and reservoirs may pose drowning risk). For more information, see this toolbox meeting guide about personal flotation devices and lifejackets in cranberry fields.